CHICAGO-On Saturday night when the Chicago Bulls celebrated Mexican-American fans at the United Center with “Los Bulls” night, the visiting Utah Jazz made easy work of their hosts, dominating the Bulls, 114-83. The 20,506 Bulls fans were entertained with Spanish-music, dancing, and games during the breaks, a mariachi clad Benny the Bull and piñata mascot, and a halftime show featuring a local mariachi band performance. From the start, the Chicago Bulls had trouble keeping up with the seventh-ranked Western Conference Utah Jazz. At the end of the first quarter, the Bulls only had three starters and one off the bench who had scored, leaving the Bulls trailing, 18-33. 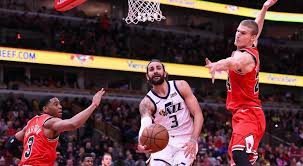 The highlight of the first half came with less than three and a half minutes left in the second quarter, when Jazz forward Joe Ingles went a fast break, made a sharp cross-court pass to Jazz guard Donovan Mitchell who then made a monstrous cutting slam dunk to put the Jazz ahead, 66-30. The Jazz had a strong showing from its bench with Raul Neto scoring 10 points in the second quarter and being the only player to score in the double digits for the quarter. The first half ended with four Jazz players tallying double digits with none from the Bulls, putting the Jazz up 70-36. The third quarter fared a bit better for the Bulls, as they scored 25 points to the Jazz’s 21, and Bulls forward Lauri Markkanen notching 12 points alone. The third quarter also saw two other Bulls starters reach double digit scoring; however, the Jazz had all five of their starters in double digits by then. The third quarter also produced the only double-doubles for each team: Jazz center Rudy Gobert with 14 rebounds and 21 points and Markkanen with 10 rebounds and 18 points. The third quarter ended with the Jazz ahead, 91-61. Ultimately, the Jazz proved to be too much to handle for the Bulls, as the home team never made any serious dent in the early lead built by the Jazz. The most outstanding deficiency for the Bulls was its 3-point percentage of 12.5%, going 2-of-16, while the Jazz fared slightly better at 34.4%, going 11-of-32. Both teams were short key players: Zach Lavine, Otto Porter, Jr., and Wendell Carter, Jr. were out for the Bulls while Dante Exum and Grayson Allen were absent from the Jazz. Bulls head coach Jim Boylen had plenty of encouraging things to say about the Bulls performance. The Bulls travel to Toronto, Canada to face the Raptors on Tuesday while the Jazz head back home to host the Phoenix Suns on Monday. Click here to view a list of other articles written by Kristy Gonowon.